Why head to a pricey steakhouse when you can enjoy grilled steak with sweet hickory deliciousness right at home? Melt butter in medium skillet on medium heat. Add onions; cook 8 to 10 min. or until crisp-tender, stirring occasionally. Meanwhile, grill steak 5 min. on each side or until medium doneness (160ºF). 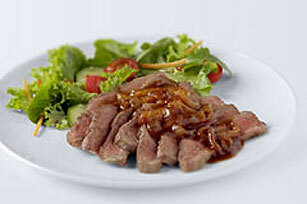 Stir steak sauce into onion mixture; cook 5 min. or until heated through, stirring occasionally. Serve with steak. Substitute a Vidalia or red onion for the yellow onion.